Honeydew honey, also known as forest honey, is a special variety of honey made not from flower nectar, but from tree sap. It is the end product of the joint efforts of both honey bees and small insects species that feed on tree sap. What makes honeydew honey special is its nutritional composition and unique properties that contribute immensely to digestive, respiratory and skin health. The honey helps combat fatigue and low blood sugar levels, soothes cough and sore throat symptoms, improves skin appearance and helps with gastritis. What is honeydew honey? It is a type of honey made from tree (and other plants) sap. Tree sap is a sugary liquid of a somewhat similar composition to nectar which serves as source of food for tiny insect species such as aphids. These insects eat the sap and excrete a sticky substance called honeydew on the leaves, branches or even trunk of a tree. Honey bees collect this honeydew from the insects and use it as food and for honey production. Large amounts of honeydew from tree sap-eating insects need to be collected to produce sufficient honey to feed an entire bee colony and fill the beehive with food. And such a plentiful food source can only be found in forests where there are enough trees and other sap-producing plants to sustain entire bee colonies, hence the reason why the honey is also called forest honey. How many types of honeydew honey are there? Honey bees don’t discriminate amongst food sources when they feed. For example, if they have access to a field of dozens of different flower species in bloom roughly at the same time, they will source the nectar from every flowering plant in the area. Similarly, if they find themselves near a forest with different sap-producing tree species and plants, they will collect the all the honeydew they can find from the insects feeding on them, without discriminating between tree species. However, beehives can also be transported to forests where there is one major tree species and will feed only on it, resulting in specific types of forest honey such as pine tree honey, silver fir honey, Greek fir honey, beechwood honeydew honey etc. Does honeydew honey contain pollen? Just like flower honey can be monofloral or polyfloral, so can honeydew honey be made from the sap of one or multiple tree species. But it can also contain flower pollen. If there are wild flowers in bloom in the forest, honey bees can very well collect their nectar too, although the said nectar and the pollen that comes with it will only be a small part of the end product. The dominant tree or flowering plant in the area will be the main food source for honey bees and will have the highest representation in the honey. Honeydew honey and food allergies. It is possible to be allergic to honeydew honey if you are allergic to enzymes secreted by honey bees to make the honey. In this case, consumption should be avoided. If the honey is contaminated with plant pollen and you are allergic to the pollen of those plants, whatever they may be, then chances are you are also allergic to the honey. Other possible contaminants in forest honeys are heavy metals, but they are generally found in trace amounts, too small to produce any serious side effects. It is not a rule that forest honeys have to have heavy metals (if the soil where the trees providing the sap is clean, then the resulting honey will also be clean). What does honeydew honey look, taste and smell like? Different varieties will look, taste and smell differently. Generally, honeydew honeys tend to be darker in color: a dark amber with dark brownish-red reflexes. Their taste is also usually stronger with a medium sweetness and they have a varied flavor and aromatic profile (resinous, pine, herbal, caramel, spicy, malty notes). 1) Excellent natural antibacterial. 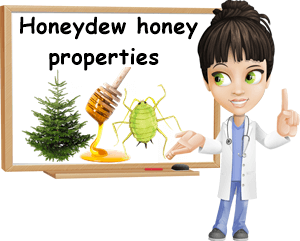 Honeydew honeys are known for their superior therapeutic effects, including their antimicrobial action. The main antibacterial agent in them is hydrogen peroxide, but the acidic pH and low moisture content of the honeys are also active participants to the overall antibacterial effect. Honey in general has many therapeutic applications, including speeding wound healing, reducing bacteria numbers at the site of the infection and preventing bacteria spread. 2) Wonderful source of antioxidants. Research analyzing different samples of honey has come to the conclusion that honeydew honeys generally have a much higher antioxidant value than flower honeys. Their dark color is usually an indicative of a higher content of antioxidants, especially polyphenols, flavonoids, but also carotenoids and others types. Antioxidants protect cells against oxidative stress and discourage the onset of chronic disease as a result of it. Moreover, they hold anti-aging benefits. 3) Richer in minerals and vitamins than floral honey. As a general rule, honeydew honey concentrates more essential nutrients than floral honeys, though the overall content of vitamins and minerals remains moderately low. However, research has showed that certain samples of honeydew honey from the most pristine areas of forest can contain excellent amounts of certain nutrients, particularly potassium (up to 3,500 mg of potassium/100 g of honey), but also magnesium, calcium, phosphorus or vitamin C. However, big differences exist between different honey samples, even when they come the same apiary, time of year, region etc. The essential vitamins and minerals in the honey, together with the natural sugars and other nutritious elements help combat fatigue, raising energy levels and preventing hypoglycemia. 4) Prebiotic benefits. Forest honeys are a good source of oligosaccharides, natural sugars that ferment and serve as prebiotics, or food source for the beneficial bacteria in our digestive tract. Thanks to their prebiotic effect, the honeys promote digestive health, improve transit time and even nutrient absorption (for us to be able to absorb nutrients well, we need healthy populations of gut flora which are sustained by eating prebiotic foods). They may also have a very mild laxative effect, helping relieve constipation (read more about what foods to eat for constipation) and improve overall gastrointestinal function. 5) Natural remedy for gastritis. It has been suggested that honeydew honey has both a gastroprotective and an antibacterial action and contributes to the treatment and management of gastritis and even stomach ulcers. The honey is believed to exert a soothing, protective action of the stomach lining, encouraging it to produce more mucous and reducing stomach acid production, thus contributing to healing gastritis naturally. Moreover, different elements in the honey (antibacterial agents, antioxidants) have been found to make the stomach unwelcoming for Helicobacter pylori bacteria, inhibitting their growth (H. pylori is a leading cause of gastritis and stomach ulcers). However, it is important to acknowledge the importance of a good diet and even medication when looking to treat and manage gastritis (read more about what foods to eat and to avoid for gastritis). 6) Natural remedy for cough and sore throat. With its sticky, sugary consistency, honeydew honey forms a sort of protective coating over the throat lining, relieving soreness and calming cough. The antibacterial elements in the honey all work together to stop bacteria spread and even reduce bacterial load in the throat, actively participating in treating respiratory tract infections such as the common cold or the flu. The honey has a wonderful natural anti-inflammatory and antiseptic action. Whenever I have a sore throat or cough, I take a tablespoon of raw honey several times a day and avoiding eating and drinking anything for up to an hour afterwards. It helps me recover my voice, calms my cough and soothes irritation and inflammation, relieving throat soreness. It also helps restore my appetite and prevents low blood sugar levels. 7) Promotes skin health. In my experience, honey is the best remedy for most skin problems, as long as you are not allergic or sensitive to it. Honeydew honey too exerts an emollient action, making skin smooth and restores its natural glow. It has a mild exfoliating and astringent effect, unclogging pores and reducing acne breakouts if used consistently. Moreover, it soothes irritated or sensitive skin and has an overall illuminating effect, making you look more radiant, refreshed and well-rested. However, not anyone can eat or use honey topically (allergies, sensitivity), so make sure you check with a doctor before eating or using honey for various ailments, especially if you suspect an allergy or have exhibitted symptoms of an allergic reaction to honey in the past. Conclusion. Honeydew honey is a healthy type of honey with a variety of beneficial effects, provided you are not allergic to it or to honey in general. The variety serves a wide range of purposes and helps improve a multitude of minor health issues, from common cold, flu and other respiratory tract infections to acne, hypoglycemia (low blood sugar levels), fatigue, gastritis, even stomach ulcers and other digestive problems. The honey should be consumed raw and at room temperature. Any form of processing, filtering or heating, takes away from its benefits and can render it completely ineffective, so always look for raw, unprocessed honey and avoid heating it in any way.